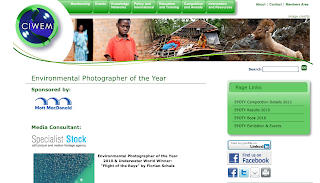 The Environmental Photographer of the Year 2011 competition is now open, and this year a new video category has been introduced to further raise awareness of environmental and social issues. Organised by the Chartered Institution of Water and Environmental Management (CIWEM) since 2007, the Environmental Photographer of the Year is an international showcase for the very best in amateur and professional environmental photography, and is one of the fastest growing competitions in the world – receiving entries from 97 countries in 2010. EPOTY is open to professionals and amateurs of any age from anywhere in the world, and encourages entries that are creative, resonant and original. The competition is completely free to enter and copyright is retained by the entrant at all times. Winners receive cash prizes and all winning entries are displayed in the touring Environmental Photographer of the Year exhibition. See past winning entries, competition details and news coverage from 2010 at www.epoty.org. You can also watch a brief video of the 2010 Awards Ceremony. You can also keep up to date with any new developments by joining our Facebook group. I hope you may be able to forward this email onto your contacts, encouraging them to enter via www.epoty.org. As I said, this is for professional and amateur photographers, so we actively encourage those with a general interest in the environment to enter as well. The competition is open until 5pm on 31st July 2011. CIWEM is an independent professional body and a registered charity, advancing the science and practice of water and environmental management for a clean, green and sustainable world.